James Marsh doesn't make documentaries. He makes art out of real life. Like his last film, the Academy Award winning Man on Wire, Project Nim is a film infused with a deep sense of wonder, except this time instead of at the achievements of a man with a dream, Marsh turns his sense of awe at the natural world - more specifically, the relationship between animal and man. Our subject is Nim, a chimpanzee who is at the center of a scientific experiment begun in 1973 by a psychology professor from Columbia University. 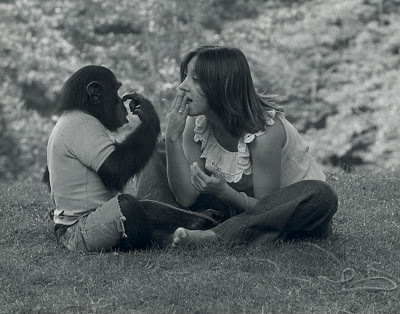 The goal - to raise him from infancy as if he were a human child with a human family, to study a chimpanzee's ability to pick up human communication and mannerisms. The film begins with the newborn Nim's harrowing removal from his screaming, tranquilized mother, and his insertion into a new life with a new, human family. Nim's life will never be the same, and not necessarily for the better. PROJECT NIM. Photo credit: Susan Kuklin. At first, Nim fits right in with his new family. But he soon begins to drive a wedge between his human mother and his human father, as he grows angry at signs of affection and begins purposely targeting his father out of jealousy. It soon becomes clear, however, that his unstructured home life is not conducive to scientific study, with no real routine or record keeping, Nim's progress goes largely uncharted. So he is removed from yet another mother and put in a more structured environment in a home owned by the university. Nim continues to grow up, getting bigger and stronger by the day. And while his sign language skills grow exponentially, so does his aggression. He may be smarter than your average chimp, but he's still a wild animal at heart, and despite the scientists' best efforts to tame him, Nim still retains a wild, unpredictable rage, seriously injuring several handlers. His caretakers soon realize that he has outgrown them, and find other, far less favorable living conditions to send him to. And so begins Nim's tragic downward spiral, being transferred from place to place, each a brand new hardship he isn't ready to face. The chimp who thinks he's a human is soon going to face the harsh reality that to most of humanity he is just another animal. 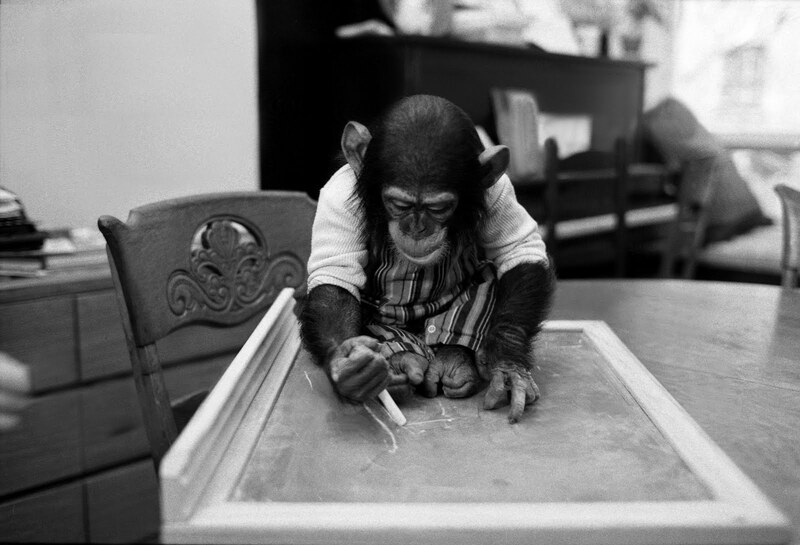 Nim Chimpsky, as seen in PROJECT NIM. Despite what the adorable marketing campaign would suggest, Project Nim is not a feel-good film. It is, at its heart, a tale of abandonment, betrayal, and human failure. Nim was raised as a human by humans, only to find himself thrown in with the rest of the chimpanzees when he is too big to handle. Nim is essentially a child ripped from his mother and abandoned by his captors. His story is a heartbreaking one, and Marsh tells it with a compelling sense of reverence. Project Nim is, in a sense, a tribute to Nim, a respectful celebration of his unique talents, and a mournful atonement for the sins of his fathers. Nim's tragic life was a product of the failures of nearly everyone around him - those he loved, and those who loved him. Was he really the person many believed him to be? Or was he just another science experiment to be tossed aside like so much dispassionate data? Marsh explores the question of what defines our humanity with great tenderness, turning Nim's story into a representation of grander questions, closely examining the relationship between man and animal. It's an enthralling story in and of itself, but its implications are even more fascinating to contemplate. Project Nim is an extraordinary documentary about an extraordinary creature. It's a harrowing and intensely powerful tale of an animal who was perhaps more human than the actual humans around him. To meet Nim is to never forget him. And Marsh ensures that no one who does will ever be the same. 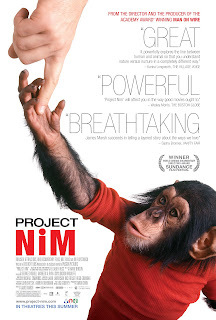 PROJECT NIM | Directed by James Marsh | Rated PG-13 for Some Strong Language, Drug Content, Thematic Elements and Disturbing Images | Now playing in select cities.